If you live in cooler regions you could be forgiven for thinking that all trees have white flowers. 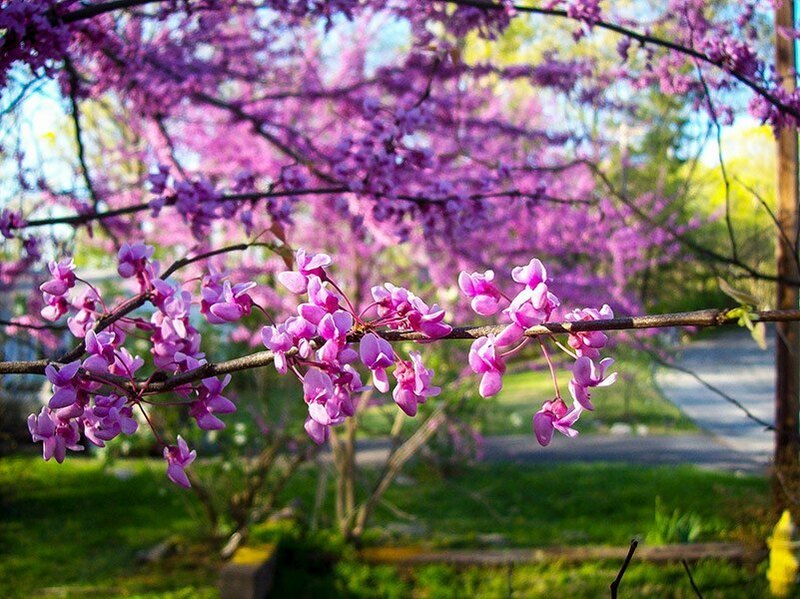 So discovering the Eastern Redbud, with its spectacular purple flowers every spring is like winning the lottery. 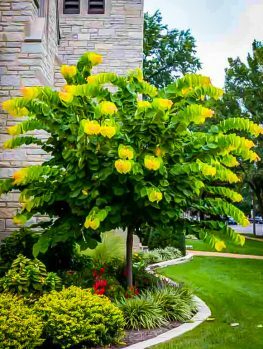 This tree should be in every cool garden, because it is trouble-free with lovely foliage that turns beautiful golden shades in fall. 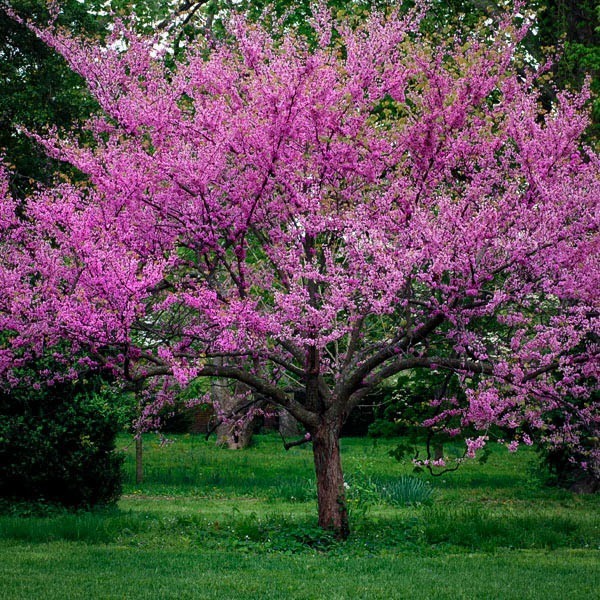 The Eastern Redbud is a large shrub or small tree that will grow to around 20 feet tall and as much across. It is fast growing and soon develops into a lovely specimen that will thrill you every spring with its stunning display of bright pink flowers carried on the bare branches. It requires little maintenance and grows in most states outside of the hottest areas. Although not very well-known, this is a gorgeous plant that should be growing in every suitable garden. It always attracts admiring attention wherever it is seen in its glorious spring display. The Eastern Redbud is a beautiful spring-flowering tree that always amazes when its brilliant pink flowers lighting up the garden while most other plants are still sleeping. It will bring you the promise of another summer and lift those winter blues. This is a native tree in the United States that should be in every suitable garden because it is fast-growing, trouble-free and not even eaten by deer. 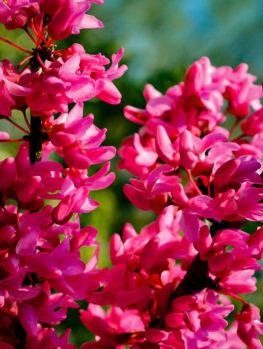 Eastern Redbuds have no serious pests and will reward some basic care with a profusion of flowers every spring. This tree will even grow near a Black Walnut, which is a tree well-known for its ability to kill many other kinds of trees planted near it. The foliage is attractive and turns yellow in the fall. In winter the tree has an elegant slightly twisted form and naturally grows to around 20 feet, with several short trunks, as a large shrub or small tree. It is an excellent choice for a semi-natural garden and shows us how beautiful our native plants can be. It can be grown as a specimen in a lawn or among other shrubs or it is especially beautiful on the edge of natural woodland areas. It also makes a lovely backdrop to smaller summer flowering shrubs and it will extend the flowering season of your beds right back to early spring if grown in that way. 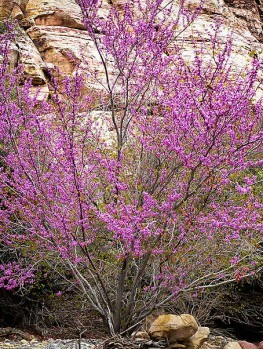 Eastern Redbud is hardy from zone 4 to zone 8 and will grow in most areas with sufficient rainfall. It does best in well-drained, moist fertile soil but it will grow in most types of soil including clay, as long as it is not wet or poorly drained. 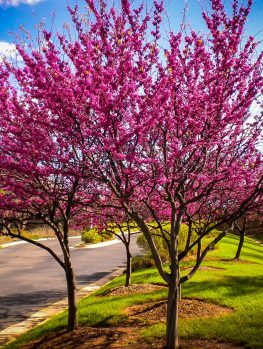 It is a close relative of the Western Redbud and if you live in the West or in drier areas generally then the Western Redbud is the tree you should choose. It is very similar in appearance but adapted to drier conditions and it will thrive in California, Utah and New Mexico. Choose a sunny or partially shady spot for your Eastern Redbud and make sure this is going to be its final location. This tree does not transplant well and so it should be planted from its pot directly to its permanent home. Allow enough room for it to spread sideways. Dig plenty of organic material into the soil, such as garden compost or well-rotted animal manure and place your tree in a hole three times wider than the pot. Replace most of the soil and water well. When the water has drained away replace the rest of the soil and apply good organic mulch around the root-zone but not directly on the trunk. During its early life, water your tree regularly and apply a tree fertilizer after flowering. Keep it well mulched. Once your tree is well established it will survive some dryness but do not let it dry out completely. Attention to watering and fertilizing will be rewarded with rapid growth into a beautiful specimen. 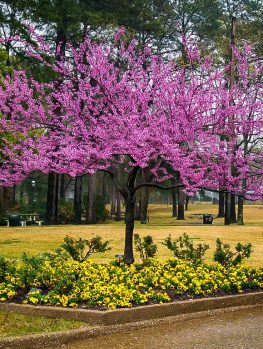 Little pruning is needed beyond removing any damaged branches and perhaps pruning side branches off the trunks if you want a more tree-like form to your Eastern Redbud. 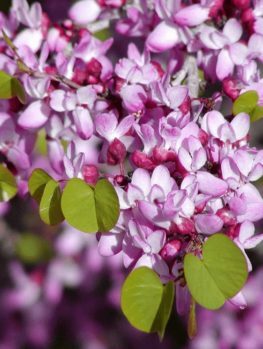 Although the Eastern Redbud has ‘Canada’ in its name (it’s called Cercis canadensis by botanists), in fact it is found naturally only in the most southern parts of Canada, just north of Niagara and most of its distribution is in the US. It can be found in the US from the Great Lakes to Florida and inland as far as Nebraska and eastern Texas. It thrives in areas with good rainfall and is naturally replaced in drier states by the similar Western Redbud. In the wild it grows among larger trees so it will tolerate some shade but does best in gardens in a sunny spot. It forms a small tree 20 feet or more in height and of a width equal to its height. 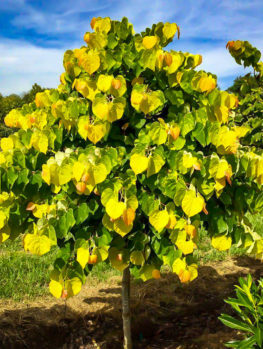 It naturally has several trunks but can be trained to a short single trunk with pruning and staking when young. It has an attractive irregular form. The bark is an attractive rich brown color and becomes ridged and furrowed as it matures. They look a little like sweet-pea flowers because this tree is in the pea family. The leaves are 3 to 5 inches across, round, somewhat heart-shaped and attractive. They turn yellow in fall. 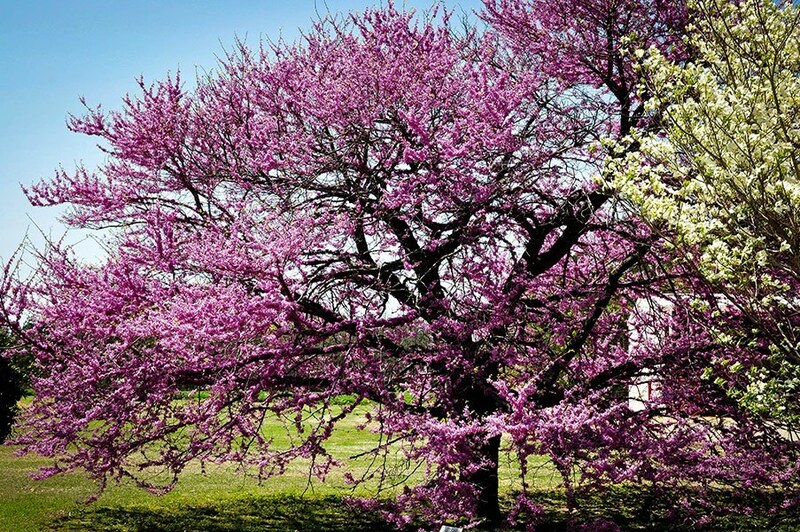 The Eastern Redbud is a special plant and only the correct plant will grow in your area. 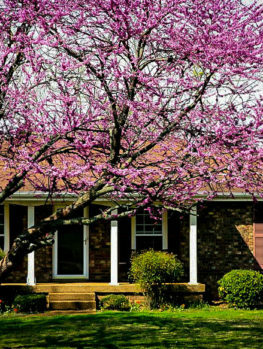 Be sure you have chosen correctly and that you shouldn’t be choosing a Western Redbud. Our trees are grown the correct way, from branches of specially selected trees grafted onto seedlings of wild trees. That way every tree shows the exact qualities of the original form. However, these take longer to produce, so avoid cheaper, seedling trees that will only be a disappointment. We sell only trees that are true to the original form and we have a wide range of sizes to give you the best plant for your purpose. However, we are constantly renewing our stock so our customers get fresh healthy plants, so supplies of this tree may be limited. To avoid disappointment order now.